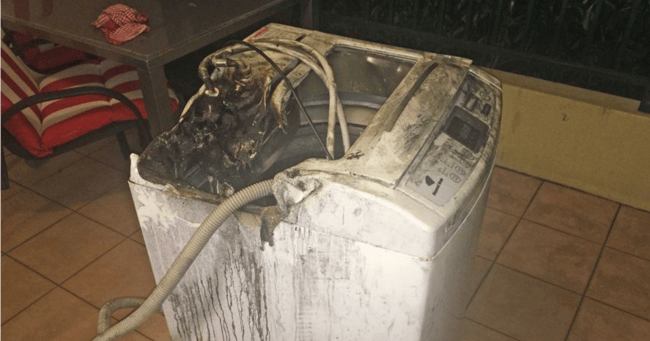 Samsung washing machine catches on fire in unit block. Samsung washing machine checks urged after fire in Sydney unit block. NSW authorities want the owners of Samsung top loader washing machines to check if their machine is subject to a mandatory recall, after another machine caught fire in Sydney’s west yesterday. Three women were hospitalised for smoke inhalation after a washer caught fire at a unit block in Auburn on Saturday afternoon. The state departments of Fair Trading and Fire and Rescue are examining the machine to determine whether it was model included in a mandatory recall ordered by the Government last year. Six models of Samsung top loading machines were affected, with more than 144,000 of them sold in Australia. Nationwide, more than 200 Samsung machines have caught fire or exploded since 2010. Fair Trading Commissioner Rod Stowe urged people to check the model numbers on their machines. “We know this is a real and present danger,” he told the ABC. “Regrettably, we have had these fire incidents. “It’s really important that people respond to the recall and make sure the machine they are using is safe. But he said there were likely still thousands of such machines in use. Those with a Samsung washing machine are advised to check the model number and either go to the Fair Trading website or contact Samsung directly for a replacement or a refund.